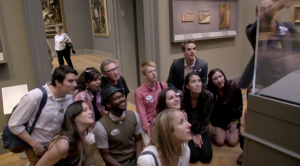 Poll: What do you think of millennial-friendly museum tours? According to the National Endowment for the Arts, the number of Americans who visit an art gallery or museum is in steady decline. Attendance is especially low among young people. Saturday on NewsHour Weekend, we present a look at a few enterprising young art lovers who have unconventional plans to reverse the decline. We want to know — what’s your view on these millennial-friendly museum tours? Take our poll (above) and share your thoughts in the comments below. Or, join the conversation on Facebook.